People have asked, do I need to take my ring off to play sport? Maybe you’ve recently started wearing a ring, perhaps you recently got married or it might be that you’ve suddenly decided a ring is a must-have fashion accessory for you. Either way, you need to know where you stand on wearing your new accessory to play football. 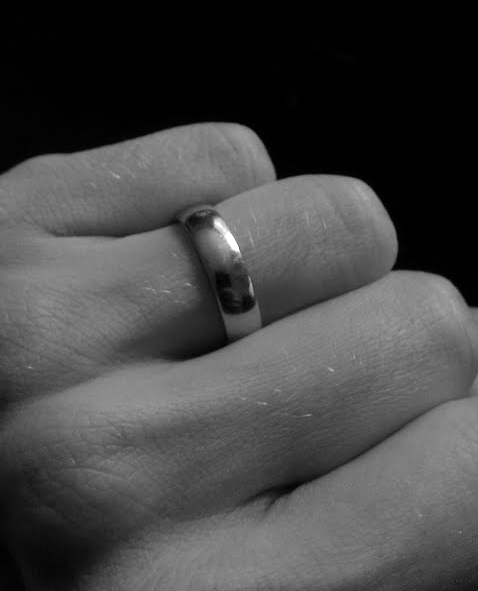 So you’re wearing a ring – should you take it off for sport? For a lot of people the idea that they might need to take off their ring will have never crossed their mind. It was this blissful ignorance that some of us folks here at 5-a-side.com lived in until recently we went on the Football Association’s Emergency First Aid course and had chance to think about it (more about that course coming up in a future post). One of the topics covered on this course is ‘cuts and bleeds’, yeah – cheery ain’t it? For the most part, you can expect nothing more than grazes or minor nosebleeds on a football field, which are both fairly easily dealt with. However, there are some absolute horrors that can occur on the pitch, and it so happens that some of those are caused by wearing a ring. As twenty full-grown football-loving men sat in a dingy room on the course, gasping at the gruesome images of injuries that flashed up on the slide show, we were left in no doubt that wearing a ring to play football is quite possibly one of the silliest and most unnecessary ways to expose yourself to a potentially shocking injury. There’s a very small chance that your ring will catch on something while you’re playing sport, but if it does then you’re going to enter a world of hurt, and it isn’t going to be pretty. Turn away now if you’re squeamish. If your ring catches on something it will naturally get dragged into and up your finger. Whilst you might be lucky, and it might not cut into your skin, if it does there’s going to be a very nasty gash indeed. If you’re unlucky, it’s going to strip the skin on your finger all the way off your hand, from your knuckle upwards. It’s going to take the top half of your finger off like a sleeve around the remaining bone and flesh. 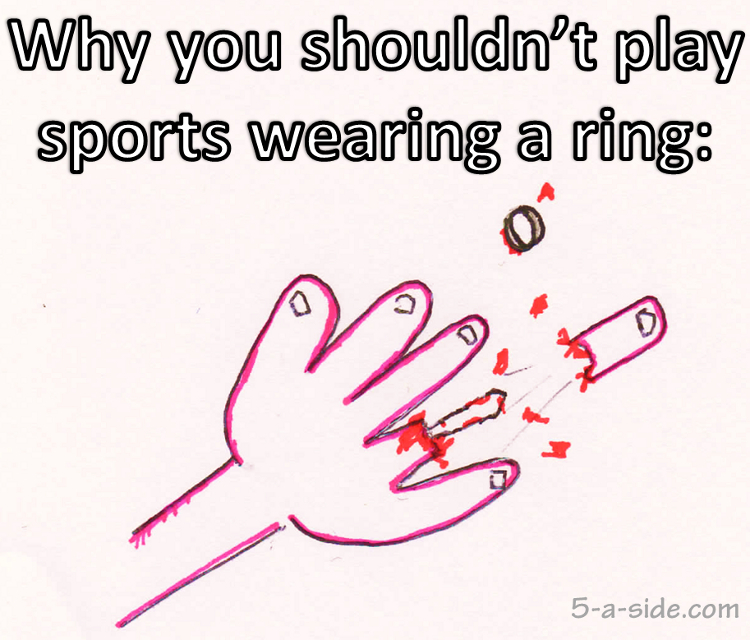 If your ring gets caught on something while you’re playing sport, it’s possible that it will do horrific damage, stripping the flesh from the top part of the finger. Now, if you think that this is exaggerated or made up, we can tell you it’s not. It rarely happens, but when it does it looks appalling. We decided not to show an actual photo on this site (what we drew in the pic above is quite enough), but if you simply can’t take our word for it and really do want to shock yourself, click this link (be warned that we told you so). I think, on the evidence, we can all agree that the answer to whether people should wear their ring to play sport is a categorical ‘no’. If you really can’t take it off then tape it up very thoroughly. Football isn’t a game without dangers but the the risk of serious injury is fairly small and that risk can be minimised further through common sense and taking a few simple steps such as taking off your ring (see our separate post: 5 Ways to Avoid Football Injuries for more suggestions). The chances of getting an injury as a result of wearing your ring is very small, but the potential damage to your finger is massive and will likely require surgery to fix! It might be a small chance of injury, but it’s one you don’t need to take at all. So, be safe, don’t wear your ring for any sports, including football. Remember: even Mr T took his rings off for a spot of wrestling, so you can take yours off for a bit of football. Yikes! The thought of this had never occurred to me. I couldn’t resist clicking that link for the pictures – wish I hadn’t now, gruesome doesn’t even come close. I definitely won’t ever be playing with a ring! Tell me about it! Even a one in a million chance of an injury like that just doesn’t seem worth it.